BROOKSVILLE, Fla. -- Brooksville Country Club might be a little off the beaten path, but with its rolling fairways and elevations, it is unique to typical Florida golf. Brooksville Country Club's 17th hole is only 146 yards from the tips, but it is fronted by water. One example: There is no water on the front side, and water only comes into play on four holes on the back side. All fairways are tree-lined, and even though there are not a lot of bunkers, they are placed strategically on most holes. William Strickland designed the golf course, which opened in 1971, and Bobby Weed redesigned it in 2006. It might be out of the way, but it is a great chance to get away from typical Florida target golf and play golf the way it was a century ago -- avoid the trees and deep rough rather than just staying away from the water. Don't plan to spend a golf junket around Brooksville; it is in the middle of nowhere, and make sure you have plenty of gas in the car because there are no gas stations for miles. But if you are a local who wants to play something different than the typical Florida golf course, Brooksville is a great idea. "There's hardly any water, so if you can see it off the tee, you don't have to worry about losing a lot of balls," said Tommy Rodgers, of nearby Orlando. "If you hit it straight, you might not lose a ball all day." That doesn't mean the course is easy. At 6,812 yards from the tips, it plays long and is unforgiving if you miss the fairway. The rough is deeper than most Florida courses, and even keeping it in the fairway doesn't guarantee an easy shot at the green. There are trees everywhere, so there will be times that a nice tee shot that goes anywhere except the dead center of the fairway means dealing with trees. Brooksville does not offer a GPS system in its carts, so plan your tee shots in advance. 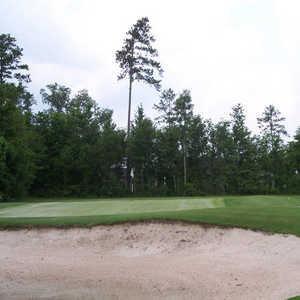 Strategy is key to handling Brooksville because a great tee shot down the center of the fairway might simply mean punching out to avoid trees in the middle of the fairway. Strategy is more important than accuracy. One more thing: The pace of play can be slow. Walking is allowed at one of the few Florida courses that lets you. Most Florida courses are carts-only. It doesn't take long for the course to show its teeth. The second hole is a long par 4 that is typical of many of the holes. It is tight and has trees that hug the fairway down the left side leaving little room for error. All of the greens at Brooksville are small, so that's where the strategy comes in to play. You have to keep it right but out of the rough on a tight fairway. Keeping the driver in the bag is the right play. After some easy holes -- as long as you keep it straight -- No. 8 is the hardest on the course. 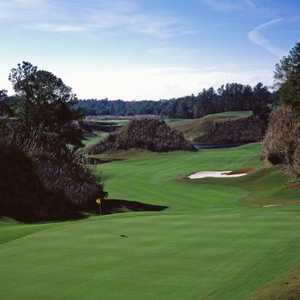 It is a 418-yard par 4 and doesn't seem long, but it has the tightest fairways on the course and a small green. Accuracy means everything at Brooksville. You might not lose a sleeve of balls on the course, but you will spend a lot of time foraging through the woods if you don't keep it straight, and No. 8 is the best example. "It's a great course and in great condition," said Bob Herman, of Deltona. "We almost got hit once. You just have to be patient, and it's a great course." 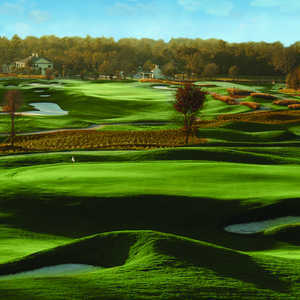 Brooksville is a challenging course, but it offers a great 19th hole with the Oak Grille Lounge and also a spa and fitness center. The driving range and putting green are among the finest in Central Florida. Brooksville is not worth planning a vacation around, but if you want a day away from Tampa or Orlando -- and to see some courses that do not look the same -- head for Brooksville and take advantage of golf with a Northern style, not your typical Florida golf. Just make sure to hit it straight and plan every shot in advance of the next.